Gator Bites, Issue #009--Open Me Up! Meanwhile, I hope everyone had a nice Easter. We did, even though it was a bit cloudy and sprinkly that day. 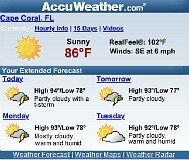 Before we know it, the daily afternoon showers will be upon us. Otherwise, the weather has been 90-91 degrees and sunny, of course! 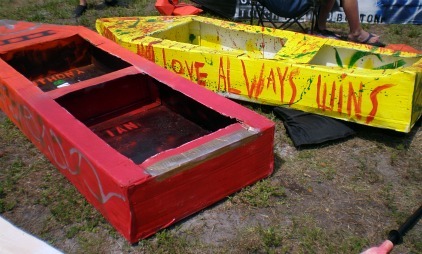 Cape Coral had it's Cardboard Boat Regatta and Dock Dogs competition in April. Some of the boats barely made it through the finish line, some boats raced with pets. To see photos and a video of what I thought was funniest of all, a race between a bunch of rednecks on Ragin Cajun vs the engineering department of FGCU (Florida Gulf Coast University), go to my Cardboard Boat Regatta Page. During the regatta, there is also a dock-jumping competition for dogs. All dogs are welcome - regardless of breed, size, or age - to try and win 3 types of events. Some dogs wouldn't jump while others had no problem. For photos and a video of a dog who knows how to work the crowd, go to Dock Dogs. I scream, you scream we all scream ......... while we were there, we checked the ice cream shop, where The Working Cow used to be, called Ice Sssscreamin and WOW ....... it was really good. 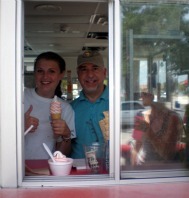 They have soft serve twirl ice cream and you can pick any number of combinations of flavors that are swirled in. Get to Ice Sssscreamin and try the raspberry mango, it's absolutely delicious! Speaking of dogs, we heard about a restaurant called The Dog, that serves good ole American food and you can bring your dog if you sit outside. 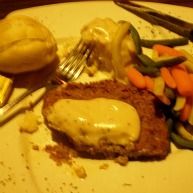 Nikki and I couldn't resist the chicken-fried steak with mashed potatoes and gravy .... it really hit the spot. We were there when they had an open-mic night and really enjoyed it when one of the waitresses sang. I thought she was good enough to be on American Idol. To see what other food and entertainment they serve, go to The Dog. We also tried a cute little Italian restaurant called Papa Joe's. They have a nice terrace and cozy dining room. 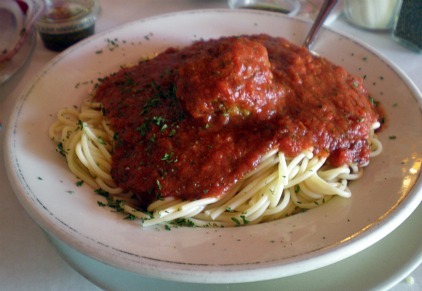 We went for the early bird specials, nothing too fancy; but good, simple pasta dishes like spaghetti and meatballs, and chicken parmesan. For, $7, you can't go wrong, for photos and more info, go to Papa Joes. 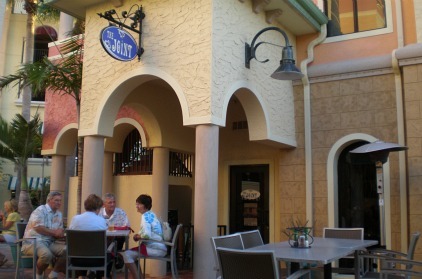 Some other new pages that I put up are The Joint, Cape Coral's trendy, waterfront restaurant that fronts the marina at Cape Harbour. We like to go there for tapas, dinner specials, and half-price pizzas on Wednesdays. Another good restaurant at Cape Harbour, is Cafe Pignoli. We went to their Sunday Jazz Brunch, which was so lovely being able to enjoy the food and music out on the back terrace with views of the marina. 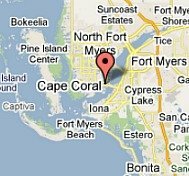 Known as Cape Coral's best kept secret, we also like their pasta, BBQ, and Motown nights. They also have wine tasting classes on Saturday nights. Need a Corvette? I also built a page about Roger Dean Chevrolet, one of Cape Coral's two car dealerships. They have been in business for years in the Cape, and have many loyal clients. I also wanted to let you know that Marina Village is no longer offering Craft and Cuisine cooking demos. Chef Jim Shiebler left, and I hope they will resume the classes again some day. 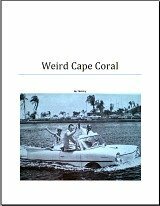 I still have a good selection of Cape Coral books, and skin and hair products for our tropical weather. We just had spring break this past week, and so I took the kids to Ft Myers Beach. 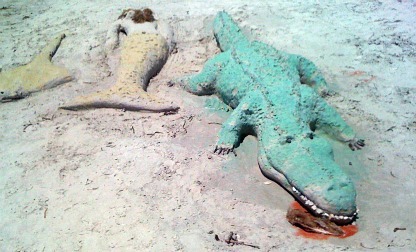 Look at the pic below to see what sandy creatures were next to our blanket.